Below the Old Town Square lies a labyrinth of Medieval tunnels and chambers. Once inhabited by prisoners and their tormentors, this ancient world has been recently restored and is now open for us to explore. It is a fascinating place, totally hidden from, and mostly unknown by, the people in the streets above. But who were the unfortunate people confined here? And what did they do to deserve such treatment? The Prague Old Town Underground Tour starts above ground where your guide gives a brief history of Prague, explaining the key events and battles that led to the establishment of the "Underground". 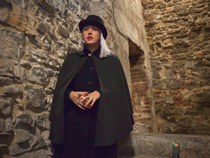 We then descend several flights of stairs to the Medieval passages to reach the former Old Town prison and torture chambers, which are spread over several levels. We find out about the gruesome events that took place, and what life was like for the famous historical figures who were detained and tortured here. We also learn the story of Prague’s jailers and executioners. Finally, the tour moves on to paranormal activity. People have experienced seemingly unexplainable events in these chambers. Is it the prisoners or what is going on? You will have the chance to capture evidence on your camera - modern technology can sometimes reveal hidden movements from the spirit realm better than the human eye! Prague is a city of mystery and legend, but you may be surprised to learn what is historical fact and what is legend - did they really act like this in Medieval times?! Every participant is given a lantern at the start of the tour, to provide an authentic experience, but also to give you comfort as we proceed. Note: This tour is not suitable for children 6 years and under. Guided tour & admission to the Underground.